Soil sampling provides the most efficient use of nutrients thus maximizing fertilizer and lime application dollars. Excess nutrients waste money and compromise the environment through groundwater contamination, says Dr. Githinji. Careful soil testing and correction insures that each crop gets exactly what it needs to grow and yield its full potential. 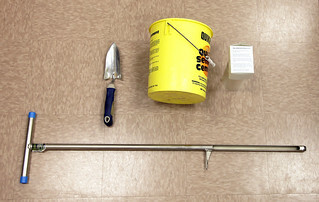 Tools needed for a sample collection include a clean bucket, a soil auger, a hand trowel, a pen and a soil sample box that can be picked up at your nearest County Extension office. Collect a representative sample by randomly collecting at least 25 soil cores from each sample area using the soil auger. Using a hand trowel, mix the soil thoroughly in a bucket to form what is called a composite sample that should represent no more than 20 acres. Place the composite sample in the soil box, include all requested details and either mail or take to your nearest county Cooperative Extension office. They will send the sample to a lab that specializes in nutrient analysis. The soil lab report provides recommendations for nutrients and lime for pH correction. Recommendations will be given in pounds per acre, which you must convert to pounds of a manufacturer’s mixture. The county Extension agent can help you do so and also suggest alternative fertilizer combinations that may match recommendations, which could save you money. Although soil sampling can be done at any time of year, Dr. Githinji suggests that the ideal time to do so is about three months before planting. This allows time to work the soil, adjust the soil pH and add any organic material if needed, he says. For more information on soil sampling or help interpreting your soil sample results, contact Dr. Githinji at githinjil@uapb.edu or (870) 575-7224.